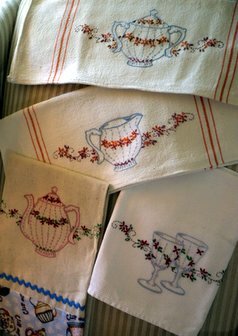 Mom used borders of ric-rac and tea prints to embellish tea towels. And sometimes she used a ready-bordered weave, as in the tea towels above. Teapots and flowers were two of her favorite subjects to embroider. These were stitched by mom, but I found the patterns for this set last winter and stitched a set of my own; seven in soft pink colors to match my Old Country Roses china and tea set. All they need now is to be trimmed and pressed, then I will post them for you to see. So pretty. I love the patterns. Thanks for sharing. I love rick rack. I never thought about using it for tea towels. When I go shopping on Monday I am going to pick up some extra.